Taipei, Sept. 14 (CNA) Chinese American historian and Tang Prize laureate Yu Ying-shih arrived in Taiwan Sunday to participate in an awards ceremony and a series of events to celebrate the first Tang Prize. Yu is scheduled to attend all of the events during Tang Prize Week from Sept. 15 to 21, according to the Tang Prize Foundation. Ho Jung-chun, deputy director-general of the National Immigration Agency, greeted Yu at Taiwan Taoyuan International Airport and presented the historian with a Business and Academic Travel Card. The card will allow him to enjoy expedited immigration clearance in Taiwan for five years, and give speeches and provide commercial or technical consulting without having to apply for a work permit. 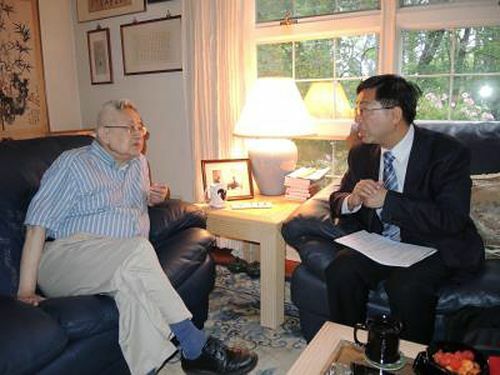 Yu, a Princeton University emeritus professor who won the Tang Prize for Sinology, is regarded by many of his peers as the greatest Chinese intellectual historian of their generation. The 84-year-old brought previously neglected aspects of Chinese history into mainstream scholarship. He has been credited with rescuing Confucian heritage from "caricature and neglect" and stimulating younger scholars to rediscover the richness and variety of Chinese culture after the ravages of Mao Zedong's Cultural Revolution, according to the U.S. Library of Congress. The other laureates will also arrive in Taiwan over the next two days, according to the foundation. They are Gro Harlem Brundtland, former prime minister of Norway, who won the prize in sustainable development; James P. Allison of the United States and Tasuku Honjo of Japan, who shared the prize in biopharmaceutical science; and Albie Sachs, a former justice of South Africa's Constitutional Court, who won the prize for rule of law. The Tang Prize winners will meet with President Ma Ying-jeou on Sept. 18 before participating in an awards ceremony that day, the foundation said. Other Tang Prize events include lectures by the laureates, a concert, a reception, a banquet and two exhibitions. The Tang Prize was established in 2012 by Taiwanese entrepreneur Samuel Yin to complement the Nobel prizes and honor leaders in the four fields.